The above figure shows simple vapour compression refrigeration system. In this type of refrigerator, refrigerant undergoes phase changes. It consists of following components. The low pressure saturated vapour refrigerant from evaporator drawn into the compressor through suction valve. The refrigerant then compressed to high pressure by the compressor and then delivered to the condenser through the delivery valve. The temperature of refrigerant also increases during the compression process. the compressor may be hermetic, semi-hermetic or open type. Read: What is a compressor? Why do we need compression? Condenser usually consists of coils of pipe through which refrigerant circulates. In the condenser, the high pressure and superheated temperature refrigerant from compressor get cooled and condensed. While refrigerant passes through the condenser coil, it gives up a large amount of latent heat to the surrounding condensing medium (typically air or water). The saturated liquid refrigerant from the condenser is then stored in a vessel known as the receiver. From receiver, the liquid refrigerant is supplied to the evaporator through the expansion valve. The expansion valve (also known as a refrigerant control valve or throttle valve) allow the liquid refrigerant at high pressure to pass to the evaporator at a controlled rate after reducing the pressure and temperature. The output of expansion valve is the mixture of liquid and vapour refrigerant at low pressure and temperature (adiabatic flash evaporation). 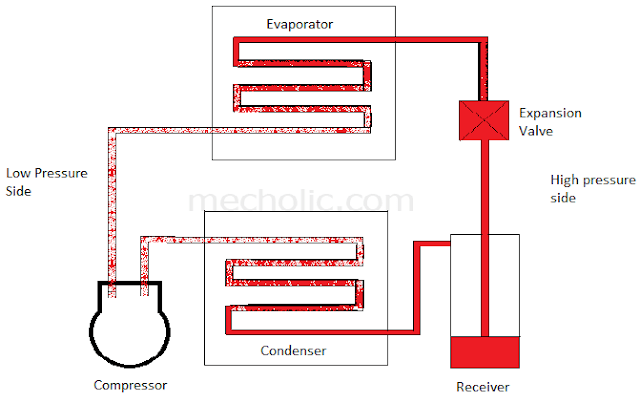 Evaporator consists of coils pipe in which the liquid-vapour from expansion valve is completely get evaporated. During the process of evaporation, the liquid refrigerant absorbs large quantity latent heat of vaporization from the medium which is to be cooled. The saturated vapour refrigerator again routed back to the compressor. The process involved in ideal vapour compression refrigeration is shown in the following fig.